I don't intend this page to be a complete report on every way possible to clean track, or to avoid cleaning it. I will describe the method that I have settled on as it provides adequate results with minimal time and effort. About 70% of large scale railways use track power. Many of these railways are indoors where track power has no special problems as large scale trains are much more tolerant of non-ideal track conditions than their small scale brethren. 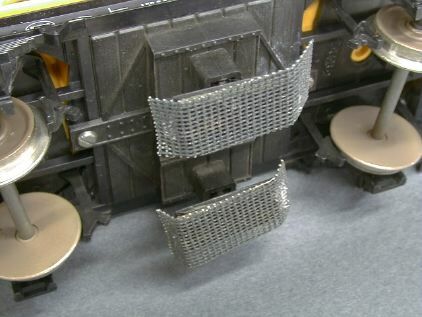 Most HO layouts have converted to nickel silver rail because maintenance of brass rail was such a problem. However, brass rail seems to work fine for large scale indoor railroads. I clean my track indoors maybe once a year if it needs or not. Outdoors operation presents an entirely different set of problems. To allow reliable operation with track power, the track must be cleaned periodically. There are about as many methods to cleaning track as there are outdoor layouts. I use brass track primarily because it was fairly inexpensive and it is very robust. However, brass oxidizes and the resultant film is essentially nonconductive. Other materials such as stainless steel and nickel silver oxidize less, but oxidation is only part of the total problem. All rail materials are subject to contamination by dust, dirt, grit, snail slime and millions of crushed ant bodies (ants seem to like to use the rails as freeways). Contamination varies by region, areas that get lots of rain will have a higher oxidation and snail slime problem. Lots of wind will increase the grit problem. Very cold weather may result in an ice problem. Here in sunny Southern California, track cleaning is not a particularly big deal so that track power works quite well. In other areas, there might be a significantly different story to tell. One major contaminant is plastic that wears off plastic wheels, especially Bachmann wheels. This is a special problem with sun heated rail which softens the wheels and makes them wear faster. Once the material gets pounded into the rails, the sun will melt in place and it gets really hard to get off. 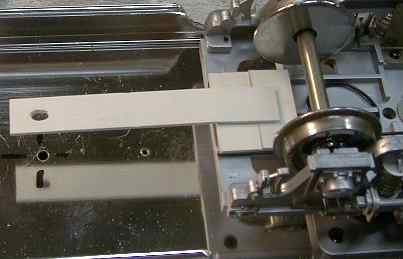 Continuous operation of locos with sliders (primarily LGB) tends to abrade this material off again, but the easiest way to minimize this serious problem is to eliminate the problem at the source. Switch to ALL metal wheels, it's expensive but it really does make a difference. Dirty wheels can also cause problems that act almost the same as track problems. If your locos, especially smaller ones, run well in curves and stutter on the straight sections, then suspect dirty wheels instead of, or maybe in addition to, dirty track. In the curves, the wheel flanges bear against the rail and power pickup is usually improved as the flanges are usually scrubbed better and are cleaner than the treads. Most track contaminants can be dealt with by abrasive cleaning. However, each problem is a little different. Grit on the railheads produces the most drastic effects, fortunately, it is the easiest to deal with. Grit will lift your locos wheels off the track and cause serious sputtering and stalling. One pass with most any track cleaning device will sweep it off the rails. Grit is usually deposited by wind, and/or splash from rainfall or sprinklers. Oxides of the track metal cause a varying degree of problems. Brass track oxides fairly readily and the oxide is thin but non conductive. Multiwheel power pickup can get by most light oxidation problems, but heavy oxides must be abraded off. 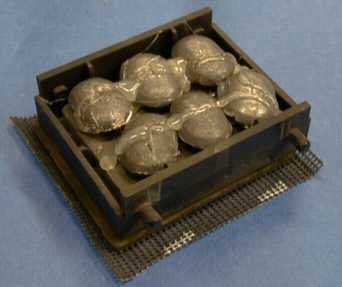 Nickel silver oxidizes less than brass and its oxide is at least partially conductive. Stainless steel isn't supposed to oxidize at all. Aluminum oxidizes virtually instantly and the oxide is an excellent insulator but it is also very thin. Oxides generally must be abraded off. Plastic can be dealt with easily, simply dump ALL your plastic wheels. The solution may seem a little extreme, but metal wheels really do roll better, add weight low where it is needed and wear much better than plastic wheels. They do add weight and will impact the length of a train that can be hauled up a grade. See my Wheel Tips Page for more information on metal wheels. If you don't want to convert to metal wheels, smoke fluid or a track cleaning fluid can often float this stuff off so that it can be wiped up. Biological Hazards usually have to dealt with at the source. If you've got snails, try bait. If you don't like spreading arsenic around your yard, try box turtles. Ants really don't like Simple Green, an environmentally friendly cleaner. Spray a little around and the little buggers will bug out. Organic Contamination. Leaf litter, tree sap, bird droppings, sticks and twigs impact both battery and track powered operations. These are mostly dealt with by hand-to-hand combat and an organic cleaner. If you have ballast that is fastened down, a leaf blower may be effective against the loose stuff. I have an ivy problem and I just have to scout the rails and pick up the dead leaves and stems. I've used three types of commercial track cleaning car/accessory, the Aristo car, San-Val's Little Wheelie Worker, and the LGB 5005 track cleaning attachment. Of the three, the Aristo car is the clear winner and further, it can be improved. Richard Lepkowski has also written with a description of the LGB track cleaning loco. The Little Wheelie Worker. San-Val sells an attachment called the Little Wheelie Worker that will fit on the trucks of many types of cars. It consists of a set of abrasive disks that are mounted off center from the rail head so that they rotate across the track as the car is pulled. San-Val claims that they add very little drag, which is true. San-Val doesn't claim that they will clean really dirty track, which is also true. San-Val does recommend that the device should be run in a train to continuously polish the track. However, polishing already usable track is not what I'm after outdoors. Since I can't keep my track in good condition all the time, what I want is to strip heavy junk off really dirty track to make it serviceable in a hurry. Outdoors, I really don't see the utility of a slow cleaning device. Indoors, the Little Wheelie Worker is another story. In this case, the track never gets really dirty so that continuous polishing may eliminate even the need for an annual cleaning. However, the Little Wheelie worker is sensitive to steps in track joints. The wheels will catch on even a small step and either bump or derail the car. The rails should be adjusted or filed to remove any steps. I also found that the disks will catch on the point rails of each and every LGB 1200 turnout when running trailing point. The point rails are just a little higher than the frog and when the disk leaves the frog, it catches on the end of the rail. This can be fixed by tapering the end of the point rail with a small file. Only about two passes with a file are required, just enough to break the corner on the end of the point rail. File both point rails. The Wheelie Worker will also bump over LGB 1056 uncoupling tracks, but doesn't seem to be much of a problem except that a couple inches of rail next to the ramp won't get cleaned. LGB Track Cleaning Pads. 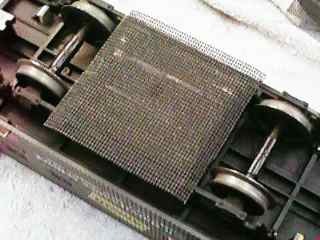 The LGB 5005 track cleaning pads mount under most any LGB 2 axle car. These little pads are made of the same stuff as the LGB cleaning block and they do take crud off the track. I use one set on my indoor layout when it comes time to polish the track. The pads add a considerable amount of drag and will tax the pulling power of most small locomotives. I really don't know how well they will perform in heavy duty service outdoors. I do notice that after a few runs around, a layer of crud packs on the pad. Light scraping with a screwdriver blade dislodges this crud. The Aristo Track Cleaning Car. The Aristo car is a bobber caboose with a weighted Brite Boy pad dragging underneath. The car adds a significant amount of drag, so I usually run it alone behind an engine. It takes about a dozen passes, but this car will take track that is too dirty to run a train on and make it serviceable. It will not shine the track, but then again shiny track is not really required. I've found that the car's pad will crud up after a few hundred feet on dirty track and become less effective. I clean the pad off with a light spray of rubbing alcohol and shop rag every pass until the pad doesn't completely load up. The effectiveness of the Aristo Track Cleaning Car can be increased by placing a drop of smoke fluid, WD-40, RailZip or ACF-50 on the leading edge of the pad where each rail bears against the pad. If the oil spreads out to a drop more than 1/4" in diameter, you've used way too much. The presence of the oil will cause the pad to collect crud faster so it should be cleaned more often. Oil on the pad will reduce the number of passes needed to make track serviceable by maybe a factor of two or three, but if you use too much oil, traction will suffer greatly and even if you use very little oil, traction will suffer some. It's a trade that you have to make. The Aristo car will bump on Kadee uncoupler magnets so the top half of the magnets should be removed before cleaning. The pad will also hang on LGB 1056 remote uncoupling ramps. There's really nothing that can be done about this. The pad will wear after awhile, but it can be replaced or refaced. Mine is over a year old and is pretty badly worn, but it still works. When it wears too much where it touches the rails, the center part of the pad will ride up on guard rails and frogs and the pad will not ride on the rails at those points so that the rails right there won't get cleaned. If the pad is badly worn, it can be rotated 90 degrees and used until a second set of grooves becomes too deep. Aristo sells replacement pads. The pad can also be refaced with a mill file to produce anther flat cleaning surface. However, USE AN OLD DULL FILE. The pad is highly abrasive so grinding on it with a good file will dull the file in a hurry. You don't need a sharp file to do this work as you are really grinding up the soft binder material that entraps the abrasive material. With any track cleaning car, it may be desirable to push the car, especially for the first pass. Wind or water borne grit can stop an engine dead. Pushing the car will tend to sweep grit off the rails before the engine is impacted by it. The LGB Track Cleaning Locomotive. Richard Lepkowski writes: "The LGB Track Cleaning Locomotive is expensive, but is it worth the money? Here is my opinion. I purchased my LGB Track Cleaning Locomotive about a year and a half ago. I put it off for a long time because of the price. I paid about $450.00 for it a Trainworld. I have arthritis brought on by Lyme disease and track cleaning was getting impossible for me to do. The loco has 7 lights and looks like some kind of railroad emergency vehicle when running. There is a three-position switch inside the cab that is reachable through the open window. OFF, RUN WITHOUT CLEANING, AND RUN WITH CLEANING. When in cleaning mode the loco doesn't go forward very fast, so instead of making several runs around the layout you do just one to clean the track. When going down a spur and you get to the end you put it in reverse and can back out quickly. It is unbelievable to see this machine going down really filthy track and see shiny almost new looking track come out from under it. On the hood hidden under a small cap is knob to adjust the forward speed while cleaning your track. Your power pack controls the speed but now the cleaning wheels are engaged. With this arrangement you have full control the cleaning wheels speed and make forward speed adjustments using the knob on the hood. You will have to play with these settings to get optimum performance. It isn't tough though. You want to have to the correct forward speed and the correct cleaning wheel speed so you don't wear out the cleaning wheels too quickly and still get the track clean. The wheels are made up of the same stuff as LGB's cleaning pads. The wheels will wear down with time and the plastic flanges will prevent cleaning. It is unmistakable when this happens the flanges will ride up and over the tie strip rail holders and you will have a skipping effect on the rails. (clean, dirty, clean, etc.) I have saved my old wheels and intend to turn down the flange down a little to extend their life. The flanges are there to lift the abrasive wheels over the plastic frogs on the turnouts and not damage them. I wore out the first set learning how to use them, and showing off how well this little machine works. The first set lasted about two months, the second set is still going. You can also extend and enhance the wheel life by putting some smoke oil on the pads. I just put some on the railhead in front of it. Once you get the hang of it, you be sorry you didn't get one sooner. By the way, you don't have to have shiny looks-like-new rail heads but if you want them you can have them with this cleaner. I don't usually wait until my track is so dirty that my trains don't run. I do run the cleaner fast around my layout as a preventive maintenance. I for one do think it's worth it." There are other cleaning cars out there, but I cannot comment on them because I don't have any experience with them. If anybody else out there in cyberspace would like to write a paragraph or two about other devices such as the G-Clean car, the Centerline Products car or any other device, I would be happy to post it here. When the track is REALLY DIRTY it may be necessary to break out a bigger hammer. My run away favorite is a drywall sander, also called a pole sander. This is a sanding pad mounted with a two way swivel at the end of a pole. On the pad is mounted a "screen." This is a coarse fabric embedded with grit. This little gem will SHINE track in ONE pass, no matter how cruddy it is. What's better, it is possible clean about 200' in under a minute while standing up. I have an LGB cleaning block and it works very well, but not nearly as well as the drywall sander. There are some space restricted access areas where it is not possible to use the drywall sander. In these areas, the LGB block is preferred. It is possible to mount other abrasive pads to the drywall sander. A 3M ScotchBrite pad (green) or 3M Metal Finishing Pad (brown) will work as well. I find that the fibers in both of these pads get hung on track joints, switch points and other sharp edges and the pads fray pretty fast. The drywall screen does not seem to have this problem and it is very tough. A screen will last 6 months or more. I do use the 3M Metal Finishing Pads for hand work, it functions exceptionally well in cleaning off rails in preparation for soldering. You might think that a device that is this effective is hard on the track. If it strips off crud that quick, it must strip off metal as well. A drywall screen does remove metal but only at the rate of 5 millionths of an inch per pass on brass track. Tests with a piece of scrap rail and a micrometer show that it takes 200 passes to remove 1 mil of rail. Track could be cleaned once a week for 40 years with a loss of only 3% of the rail. My trusty pole sander broke after a year or so of service. It was made of plastic parts and the swivel just couldn't take the load. On the way back from a run to Home Depot to buy a heavier duty one (I found a cast metal version of the same thing, I hope it holds up better) it occurred to me that the plastic sanding pad was still in good shape and still potentially usable. I found that the pad could be used under a car to be an effective track cleaner. It takes about 3 or 4 passes, but this car actually shines the track. Since I had all the bits and pieces laying around, this car cost me $zip.nothing out of pocket. Many years ago, the legendary John Allen used a masonite block with a couple of nails glued to it so that it could be dragged under an HO boxcar. I still see these things in use. The sanding pad is a little long and tall to fit under a boxcar, but it fits under an Aristo Streamliner just fine. Initially I removed the equipment box and air tanks from underneath the car and drilled two holes on the centerline exactly 6" apart. I also drilled two holes down the centerline of the cleaning pad exactly 6" apart and glued two 3" nails in the holes (after cleaning the rubber pad from around the holes to clear the nail head). Two 16 oz fishing weights provide enough weight to allow the screen to do an effective job. The car has quite a bit of drag, but any reasonably strong engine can handle it. The car cleans the track quite well, however due to the long length of the Aristo Streamliner, the pad would be partially pulled off the outside rail in curves much less than 5' in radius and the outside rail will not be cleaned as well as the inside rail. I installed some styrene levers on the trucks that were drilled and slotted to accept the nails that were in the pad (the nails were cut short so that they didn't reach the car bottom anymore). As the trucks rotate, they slide the pad 1" either way so that the pad stays on the rails. The levers do interfere a little with the nuts on the pad ends (the original wing nuts were replaced with hex nuts) but it works fine. Actually it works too fine, the pad moves about 1/4" too far. If I rework this again, I would mount the levers on the top sides of the trucks and use the bolts at the end for engagement. The existing bolts are a little too short so that they would have to be drilled out and replaced with longer ones. This will eliminate the interference AND cause the pad to move sideways a little less. It is amazing to see the pad swing side to side as moves in and out of the turns. Now it cleans both rails very effectively. There is a noticeable improvement after only one pass and after about three passes, the track is plenty clean enough to run trains. To return the car to revenue service, just lift the car, remove the pad from the track and set the car back down. I was standing in line at the Big Train Show at the Queen Mary and a guy named Frank recognized my name badge. He commented on the effectiveness of the pole sander and he also said that he used the Aristo car. Then he suggested that it might be possible to attach a drywall screen to the Aristo track cleaning car. It is indeed possible, and it does work. I took a regular drywall screen and cut the end off and glued it to the pad with a couple of beads of hot glue run close to the middle where the pad will never ride on the rails. The screen is stiff enough so that the ends can be bent up so that they won't catch on track obstructions. The car carries enough weight to make the pad effective. It still takes a dozen passes or so, but now the rail ends up shiny clean instead of just clean enough. This car isn't as effective as the "Improved Track Cleaning Car" described above, but it works better than the stock Aristo car. At the expense of additional drag, the car can be made more effective by adding a little weight to the cleaning block. The block can be removed by removing two screws from one side of the block and it will drop out of the bottom of the car. Then a few ounces of lead weights can be glued on top of the cast iron weight that is already there. This same modification is practical on the LGB 5005 Track Clean Pad attachment. When the original foam pads wear out they can be replaced, or small patches of drywall screen can be hot glued over the old pads. The best place to apply the glue is on the END of the pads so that the folded up end of the screen is held up and the glue won't foul the working part of the screen. The car is much more effective in stripping crud, but it also has much more drag. A weighted LGB Porter is just about at its limit when pulling just this one modified car. It is important that the ends of the screens be turned up or they will catch on turnouts or any other step in the rail. You can treat your track with smoke fluid, WD-40 or some other light solvent oil. This really does make a short term improvement, but don't expect miracles. I use a material called ACF-50 which is an aircraft corrosion inhibitor and it works OK. This stuff looks, feels and smells like WD-40 so I expect that it works the same as well. One caution, you don't need much. One SMALL drop on each rail once in awhile is plenty. Let your train wheels or track cleaning car spread it around. The thin oil film inhibits oxidation and tends to break up oxides that are already there making it easier to clean them off but it does impact traction. If you already suffer from wheel slip, you'll want to avoid oil treatments. Over the long term, the lighter components of the oil will evaporate and leave a film of heavier gunk behind that has to be cleaned off. I find that after a period of time, cleaning with oil on the track cleaning car pad isn't entirely effective and I have to go over the track with the track cleaning car dry a dozen times or so (or the drywall sander once) to clean everything off.